With the 16 x 24 Ultra Plush Microfiber Towel, you get a two-for-one cloth! One side is soft and plush, the other side is a terry-style microfiber Use this towel for all your auto detailing needs. Dry or apply wax, detail your car interior, and reove dust and dirt. These cloths are safe to use on glass, fine auto finishes, and more. Lasts through hundreds of washes, so you can reuse again and again! 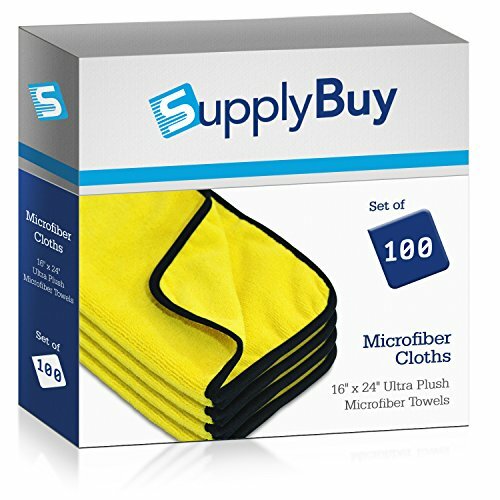 Pack of 100 - SupplyBuy Ultra Premium Plush Microfiber Towels 16x24. Holds dust, dirt, excess wax and sealers, and moisture. One side is soft and plush, other side is terry-style microfiber. Safe to use on all types of surfaces, including glass and fine auto finishes. Split fibers prevent fraying. Lasts through hundreds of washes! Designed for all your detailing needs, but use anywhere you like!